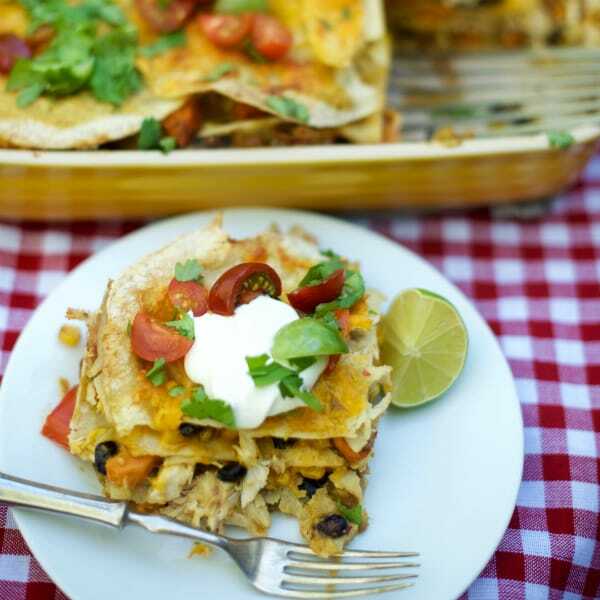 Enjoy this Green Enchilada Chicken Bake Casserole, an easy crowd-pleasing delicious weeknight meal, potluck or party dish! This post has been updated with new photography! Do you believe in hospitality? My friend Heidi, author at Foodie Crush, does. Recently my husband and I visited her family in Salt Lake City, where they hosted a dinner party for us and other friends. The highlight of the trip and staying with Heidi’s family? 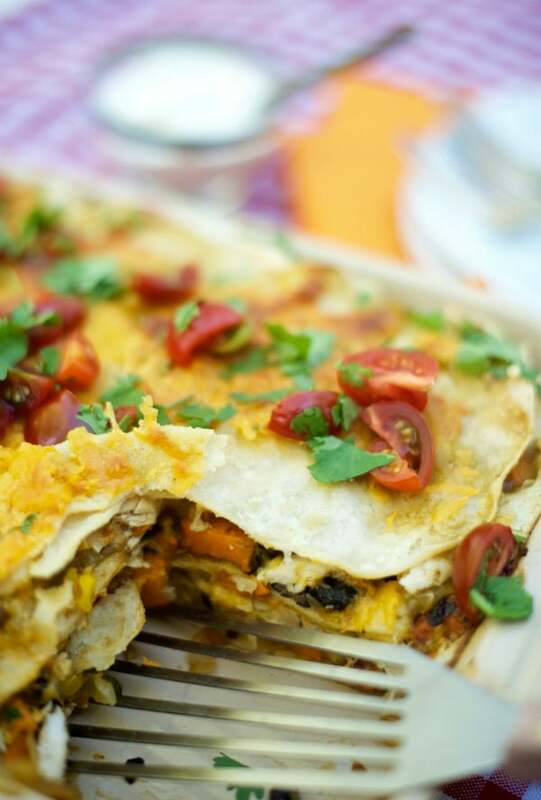 Seeing her in action, in her own kitchen–full-swing hostess-with-the-mostess–making this incredible dish and recipe that I’m sharing today, Green Enchilada Chicken Bake Casserole. 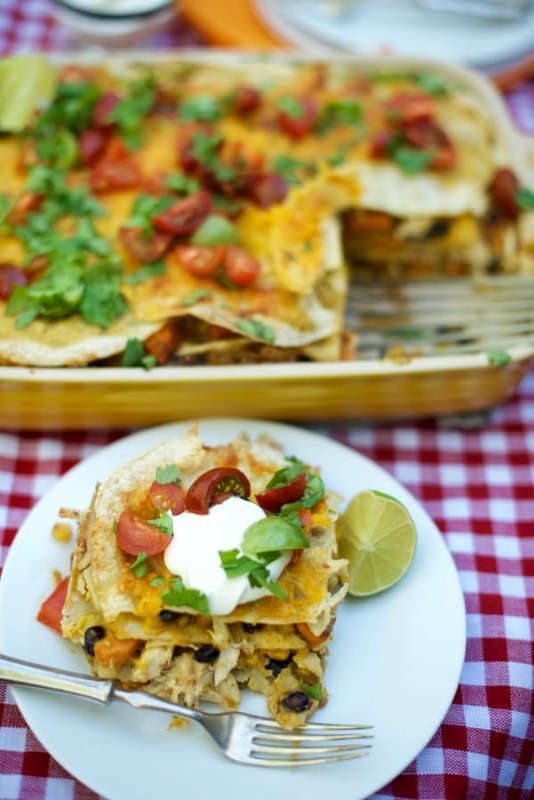 A Mexican potluck is one of the easiest ways to entertain. Everyone brings a dish, you make one giant main dish, set out the drinks, chips, salsa … and everyone digs in! This Green Enchilada Chicken Bake Casserole is so good. Since this party, I’ve doubled the recipe several times, tossing in the oven to bake before a large group came for dinner. It’s the ultimate “potluck” bake! Shredded chicken, black beans, cheese, sweet potatoes (love sweet potatoes in a Mexican casserole). 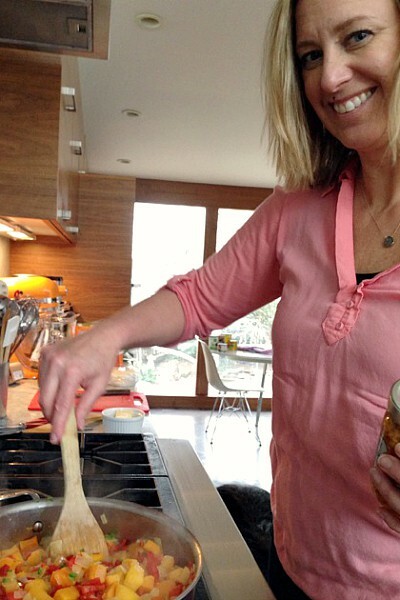 By the end of our 4-day stay, I knew Heidi’s kitchen well. Where to find the coffee (very important), silverware, dishes, knives, cutting boards … and the fridge? Well, we helped ourselves to leftovers several times. And knew how to find something yummy to munch on for a good snack. It’s fun when you’re a guest in a home where they really welcome you into their kitchen! I want to say a few things about hospitality, and out-of-town guests. If you’re in an entertaining slump, hospitality is remarkable and can really pull you out of that rut. It really can. 1. Get ORGANIZED: It makes you get organized, tidy up, and plan out a menu or two. It gets your mind off of yourself and on to others, thinking about their needs and what they would like. Heidi and Jeff were so hospitable, always making sure we had everything we needed. 2. Bring PEOPLE together: Think of mutual friends of your guests, and invite them all for a meal one night. Try potluck if the meal is too overwhelming for you. 3. Think about WHY: Think about why you are opening your home. It’s the perfect time to dive into the lives of your guests, getting to know them better. Ask questions about their past, families, what makes them happy, what makes them sad. Find value in others and what makes them unique in this world. One night the 4 of us sat up until 1 am talking about our extended families, our trip to Ireland, our pasts and present lives. It’s awesome to get to know new friends! 4. Think about HOW: Think about how you can involve your guests and make the time together fun. These days everyone seems to expect “potluck.” Ask your guests to bring a dish, set it out, and dig in! 5. Think about WHERE: Think about planning an easy buffet-meal for a small dinner party. With a buffet, the guests can mingle—stand or sit— so make sure and have your table ready. Just have a stack of dishes ready! 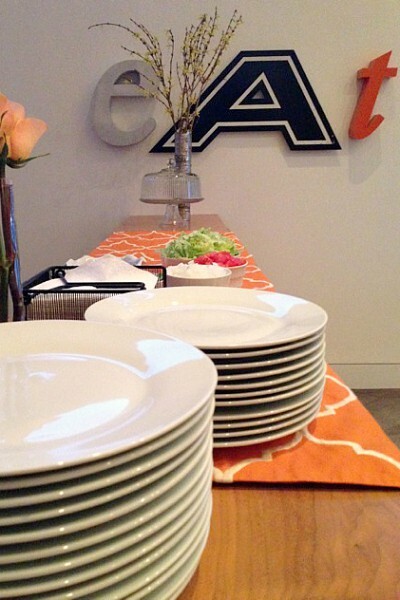 When’s the last time you hosted people in your home and planned a small dinner party for out-of-town guests? Preheat oven to 375F. Spray a 9-inch x 13-inch casserole dish with non-stick spray. Heat 3 tbsp oil in large pan sauté sweet potato on medium/low until tender (about 15-20 minutes). In separate pan, heat 1 tbsp oil and saute onion and red pepper for about 5 minutes. Mix in the half jar of corn salsa, spices, salt and pepper to taste, black beans and finely chopped jalapeño. Add in drained beans and sweet potato. Wrap a dozen corn tortillas in a moist paper towel and microwave for 1 minute to soften. Repeat again with the other 12 tortillas. Shred the chicken into bite-sized pieces; set aside. Layer 6 tortillas into the bottom of the casserole dish, arranging them so the whole surface is covered as much as you can. Over that make a layer of the vegetable mixture, 1/3 of the chicken, and 1/3 of the cheese. 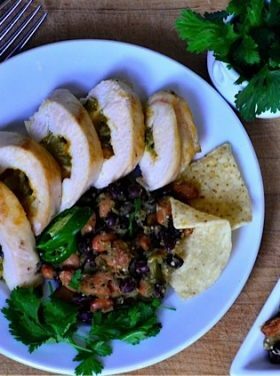 Drizzle with green enchilada sauce. Repeat the process 2 more times, ending with the rest of the sauce and cheese on top. Bake uncovered until the casserole is bubbling and cheese is melted and browning on top, about 40 minutes. Let sit about 5 minutes before serving hot. Serve with sour cream, tomatoes, and chopped cilantro. Mexican Potluck MENU: Mexican Rice Salad [RE], Mexican Flan Cake [RE], Shrimp Guacamole Bites [Well Plated], Watermelon Feta Guacamole Recipe [Two Peas and Their Pod], Mexican Street Corn Pasta Salad [Chelsea’s Messy Apron]. The sweet potato .. should it be peeled and diced then sautéed ? Very delicious chiken bake casserole recipe. I would try this out this weekend for my family. Hosted a graduation party a few weeks ago, and hosting a small group this coming up weekend. Haven’t had out of town guests since my daughters wedding, but that was a fun time. It was my aunts and grandma and cousin and so what was awesome was everyone pitched in and brought food. Are the beans mixed in with the chicken or with the vegetable mixture. Probably doesn’t matter, but it would be good to correct the recipe. Please give the ounce amount for the enchilada green sauce. at what point do we add the beans? Aww this looks so great Sandy! So many sweet people in one room! And what a great comment from Anna *tear* keep doing what you are doing, you touch people’s lives everyday! I followed the pioneer woman’s link to your page and I really thank God I did. 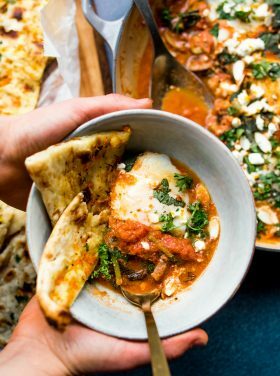 Your page has so inspired me (and has even brought me close to tears) and given me the courage to step out of my comfort zone to host a dinner party. I have been thinking about it for so long but dont end up following thru due to fear. It really comes down to just getting over it and loving others. Thank you for your blog. So sad I missed this! Sounded like such a fun night and what a beautiful house! You two together are amazing! 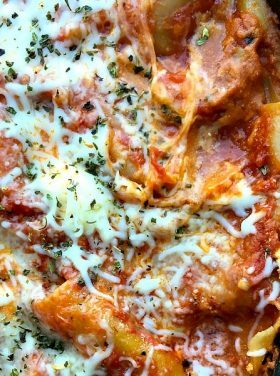 Wow, what great post and the enchiladas look killer! Love all the tips – what a great way to celebrate the bond of friends – simply, and with love. Perfection. We had a group over several weeks ago. I provided the main dish and everyone else brought a side dish or dessert. It worked out perfect with little stress!! It’s been about a year since I planned a party for out of town guests, and then it was just one couple, but I usually include a few local folks in that dinner plan..this meal looks yummy! Looks like a fun time. Looks like you had a lovely evening. Beautiful post. 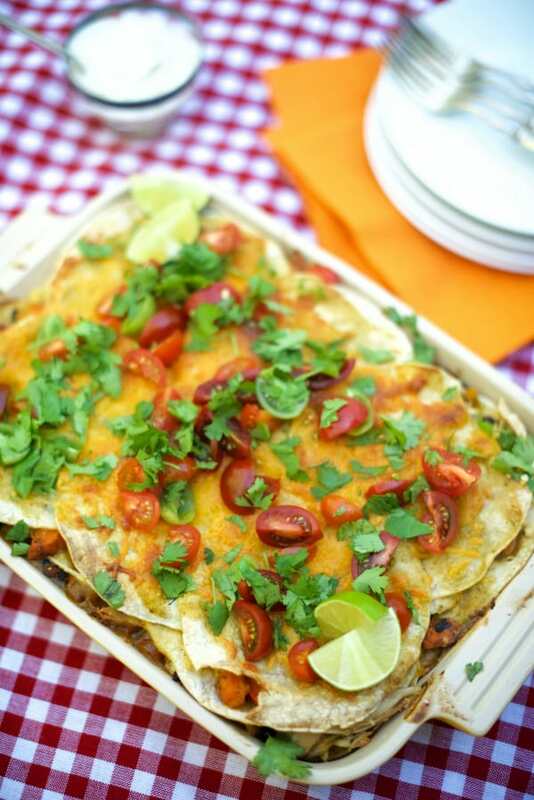 And my family LOVES a pan of enchiladas! Beautiful blog Sandy! I couldn’t agree more. I like to say that hospitality is a message we give others about their value…it’s not about impressing people but rather bringing comfort and care. What a relief! You live this so beautifully in your posts and in your life. I hope one day to experience hospitality with you real-time! Thanks for all the ideas! We have company regularly(weekly) and I love hearing that others do too. Face to face contact with people is sorely lacking these days. So much fun to sit down and chat around a meal. Couldn’t agree more, Diana. We’re all too busy … (sigh). Love everything about this! Looks like you all had a wonderful time. And this casserole — WOW. Great tips, and a delicious looking casserole, too!